The Prince finds himself hanging onto critical acclaim by his fingertips with The Forgotten Sands. The Scampering Sovereign, normally so impeccable with his timing, has well and truly fudged up his leap onto the game shelves this time around. To his left, his right and from above, the juggernaut that is Mario Galaxy 2 is closing in on him, like a spinning pillar of doom, ready to knock this pretender to the platforming throne off its perch. But it is to Ubisoft Quebec’s credit that despite all this excellence cracking off around it, Forgotten Sands on Wii still manages to clamber to safe ground. The pedestal it winds up occupying perhaps isn’t as high as had been hoped, but it’s not one without merit. Forgotten Sands follows the long-established Prince of Persia template to the letter: you enter a room, work out how to get from A to B by chaining together wall-runs and jumps, and occasionally solve a few mild puzzles involving pressure plates and big ol’ moveable statues. The level design is a lot more conservative than that seen in the Sands of Time trilogy though, mostly to compensate for the camera. While there are still those brain-swelling moments where you finally work out how to scale the unscaleable, they’re comparatively far and few between, with linear pathways reigning supreme. In fairness, the linear option is often the most preferable, as it’s very difficult to get a good overview of the more expansive rooms. The camera can be moved around by holding C and waving the pointer around, but it’s very limited in movement and the challenge comes not from timing your jumps but wrestling with the camera until you can get a glimpse of the vine or ledge that’ll hoist you up to the next stage. A blue line that traces a path between the Prince and the ledge he’s eyeing up, telling you that you can make the jump, is symptomatic of the difficulties the player has in gaining any sort of perspective in a game where perspective is everything. You wouldn’t imagine that this version had been specifically designed for Wii, what with all the woes the remote inflicts upon you. But the remote isn’t always jabbed, thorn-like, into the Prince’s side. An on-screen cursor can be used to temporarily zap enemies into a petrified state, while blue orbs can be activated to, for example, disintegrate a platform from under the feet of a far-away archer who’s making life difficult for you. The remote’s also key to using the sand powers that the Prince gains by awkwardly French-kissing the golden statues he comes across from time to time. These powers are better on paper than they are the screen, but at least they inject a bit of variety into the proceedings. The Sand Hooks power enables you to place grabbable hooks onto walls, but only in pre-determined spots. Later on, you’ll gain the ability to create whirlwinds that propel you into the air, but again, only in clearly defined places. Compared to the freeform brilliance of Cloud Mario these powers are stunted, contrived and, let’s be honest, they may as well not exist. 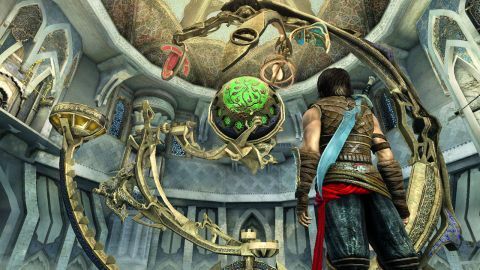 Thankfully, all that has ever been good about Prince of Persia still shines through. The controls, although sometimes sticky, are intuitive and make controlling the Prince a pleasure, and there are plenty of fist-in-mouth moments as the game reverts to slow-mo during an extra-long leap of faith. The locations are bright and luxurious, and there’s much joy in simply making your way through the levels, even if your brain doesn’t always have to be switched to full power. It’s nothing we haven’t seen done better and bolder before though, which means that while there’s plenty that’s commendable about Forgotten Sands, to love it would require a larger leap of faith than even the Prince himself is used to making.